Apple Stores are easy to recognize - the big glass facade, rectangular solid wood tables, recessed lighting, but Cupertino has failed to patent this design with the U.S. This changes now, after Apple submitted a 122-page document explaining in great detail why the layout of its retail stores is unique. Interestingly, while Apple couldn’t secure a patent on its retail store design earlier, it did have a patent on the signature glass staircase. It might seem controversial to patent a store layout, but if there was one store that many tech companies would try to mimic that would definitely be the Apple Store. It’s also quite telling that Microsoft has asked for a time extension on that patent to stand against it. Gonna line up at the Apple store tomorrow :) sweet!!! Ask Apple to patent its failure too so that nobody can follow that! What's next? They will pattent it too? Lol. Next is they will patent the long queues outside store so any store with a queue is a candidate for being sued. AS market share is falling apple is still trying these stupid techniques to win back customers. Pathetic ... good Taj Mahal was not patented. Wow!!! They could do that.. :P Apple's strategy: Bizarre patents and sue anything which could be "innovative and revolutionary"!! 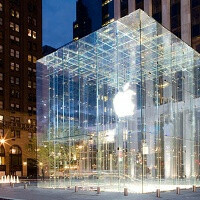 Man they now say u cant copy our istore glass building. They are the worst patent troll in the industry. Pretty soon they would buy the word trademark. This is so pathetic... Hey! Apple, I've got an idea! Why don't you patent Catholic Cross, Islamic Moon or even David's Star? You would get zillions of dollars by suing those religions! #Sarcasm. I hate Apple. Idiots! I agree, but it's really annoying to read this kind of news. They are desperately wanting to sue everybody in order to get money. Disgusting. The only thing Apple won't patent is the backbone, because they don't have one. As d lover of some Apple products, this is totally embarrassing. What is next, the lounge room layout. Cos now many stores will start to trademark their store lay out, anybody opening a store will need to apply for the rights to have a store layout, apple is creating a mess in da industry now. I guess they will do anything to have any reasons to litigate and try to make money off of...Now they're going after department stores and its designers... Unbelievable!!! What's next?! A patent for "Genius Bar" or something stupid like that?!!!!! Oh wait....they probably tried already...Really hate the greedy bitten fruit co.! get ready to be sued then. My question is why would anyone want to copy an Apple store? Certainly nothing special about it at all. God people use your brains. I wonder by the end of the year, what do they have left to patent/trademark?